A few tenths of an inch of snow dusted High Point (Sussex County) overnight during November 7th-8th, as seen looking northwest towards the Delaware valley fog near Port Jervis, NY. Photo courtesy of Shawn Viggiano. Even in a rather tranquil month, there are always interesting aspects of New Jersey’s weather and climate that can make for memorable situations. Such was the case during the 11th month of 2017. On the heels of a mild October and first week of November came one of the coldest early-season blasts on record on the 11th. Then the 19th saw some of the strongest winds of the year across the state. Overall, dry conditions by month’s end put the northern Highlands in the D0 (abnormally dry) category on the US Drought Monitor map, threatening to expand further into the state should dry conditions persist. Rainfall averaged 1.68” across the state. This is 1.93” below the 1981–2010 mean and ranks as the 19th driest November since 1895. It was the driest since 1.30” fell in 2012 and well above the record low 0.54” in 1917. The statewide average temperature of 44.3° tied with 1938 as the 75th coolest (or 49th mildest) on record. The average was 0.9° below the 1981–2010 mean, but 0.8° above the 1895–2017 mean. This demonstrates how New Jersey has warmed in recent decades compared to earlier in the 20th century. 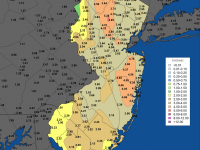 The far south was the wettest NJ region during November. However, even there, totals were below the long-term average. Three Middle Township (Cape May County) CoCoRaHS stations saw 3.19”, 2.92”, and 2.86” for the month. 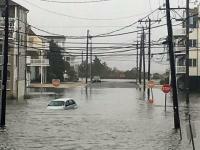 Sea Isle City (Cape May) caught 3.11”, Galloway Township (Atlantic) 2.97”, Woodbine (Cape May) 2.96”, and Stafford Township (Ocean) 2.87”. The north saw the least precipitation, with two Blairstown (Warren) stations coming in at 0.88” and 0.91”. This was followed by Andover (Sussex) at 0.89”, Stockton (Hunterdon) 0.93”, West Milford (Passaic) 0.97”, and Hardyston (Sussex) 0.97”. The first precipitation of the month didn’t arrive until the 5th, with totals no greater than the 0.41” in Upper Deerfield (Cumberland). Less than 0.10” fell north of central NJ’s Interstate 195. A more meaningful event arrived during the second half of the 7th. Rain fell in the south, while a mix of light sleet and snow occurred for a brief time in the north. 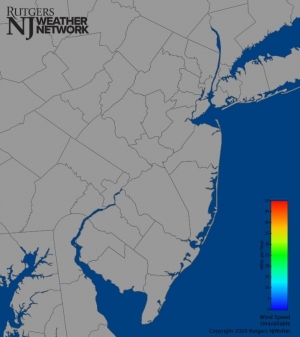 Southeast of the NJ Turnpike, over 0.70” fell, with over an inch from coastal Ocean County southward to Cape May County. 1.31” and 1.30” accumulations were found at two Middle Township stations, while two Sea Isle City locations saw 1.30” and 1.27” and Linwood (Atlantic) received 1.27”. 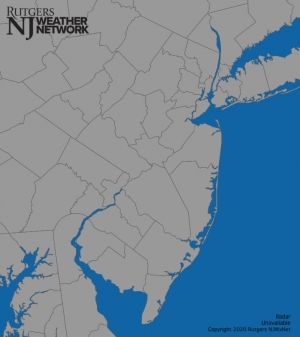 Only a few tenths of an inch of precipitation fell in north Jersey, mostly as rain, but with some of the aforementioned frozen precipitation counted within that melted total. 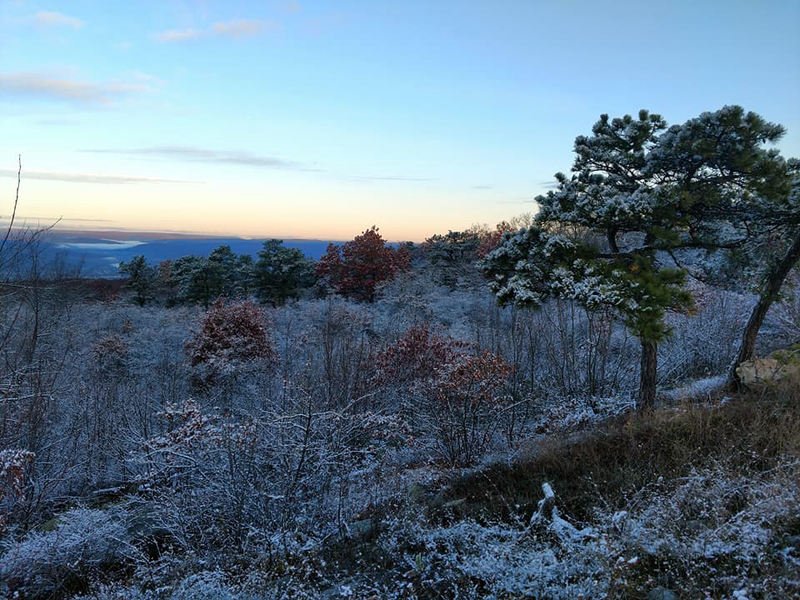 The only measurable snow was a few tenths of an inch at High Point Monument (Sussex), as shown in the photo accompanying this report. The next precipitation fell in the early hours of the 13th. Rainfall was heaviest in the south, while the higher elevations in the northwest picked up a trace of sleet. Middle Township again came out on top with 0.60”, followed by 0.53” in Lower Township (Cape May) and 0.51” in Egg Harbor Township (Atlantic). 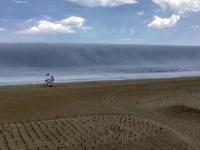 A tenth to several tenths of an inch of rain was scattered across southern and central regions, with less to the north. Next up, the morning into the afternoon of the 16th saw less than a 0.30” rainfall, mostly in the northeast corner of the state. The afternoon of the 18th until shortly after sunrise on the 19th brought a widespread 0.30”–0.40” across NJ. However, between 0.40”–0.80” fell in central locations and less than 0.10” in Cape May County, despite a few rumbles of thunder heard in Sea Isle City. Four CoCoRaHS stations in Franklin Township (Somerset) received 0.80”, 0.58”, 0.57”, and 0.57”, with two in New Brunswick (Middlesex) catching 0.74” and 0.73” and Montgomery (Somerset) 0.74”. Following the frontal passage, which was associated with a deep area of low pressure to the north, the winds howled throughout the day, not fully abating until midday on the 20th. From late on the 19th into the predawn of the 20th, there were some snowflakes in the air in the north, southward to Peapack-Gladstone in northern Somerset County. Maximum wind gusts at NJWxNet stations included 65 mph at High Point Monument, Fortescue (Cumberland) 52 mph, Atlantic City Marina (Atlantic) 52 mph, Pennsauken (Camden) 51 mph, Seaside Heights (Ocean) 50 mph, and 40–48 mph at 22 other WxNet locations. The accompanying map shows most, but not all, of the maximum gusts (some values are hidden on the map so as not to overlap with gusts shown at nearby locations; Figure 1). The lower values on the map are associated with sites that are somewhat sheltered from the wind (mostly by trees), while the higher values are in more open/exposed locations. There were no reports of significant damage, though some trees and limbs fell and scattered power outages occurred. The barometric pressure fell to a monthly low of between 29.20”–29.30” across NJ during the first half of the 19th. Figure 1. Maximum wind gusts (mph) at Rutgers NJ Weather Network stations on November 19, 2017. Just the second event of the month to produce (barely) an inch of precipitation somewhere in NJ occurred early to mid-morning on the 22nd. Cape May County was again the winner, with 1.04”, 0.90”, and 0.85” at three Middle Township locations, 0.96” at Woodbine, 0.89” and 0.76” in Sea Isle City, and 0.88” in Dennis Township and Lower Township. Nothing fell in the northwest, less than a tenth of an inch elsewhere up north, 0.10”–0.20” in the NJ Turnpike corridor, and 0.30”–0.50” from there southeastward through Atlantic and Cumberland counties. The highest barometric pressure of the month was 30.50”–30.60” across NJ on the 11th. As this high-pressure system moved into the state on the 10th, winds gusted to 49 mph at High Point Monument and 40 mph in Seaside Heights. In addition to the 40 mph or greater gusts on the 10th and 19th, there were nine other November days where gusts exceeded 40 mph. Most of these higher gusts occurred at High Point Monument, including 49 mph on the 3rd, 48 mph (6th), 54 mph (18th), 40 mph (20th), 51 mph (22nd), 41 mph (23rd), and 43 mph (29th). The 16th saw gusts to 42 mph at the Monument and Pittstown (Hunterdon) and 40 mph at Seaside Heights. Wind at the Atlantic City Marina gusted to 42 mph on the 18th. The thermometer topped out at 60° or higher at one or more NJWxNet location on 16 November afternoons, the range of mild dates extending from the 1st to the 30th. Of these, the 65° mark was equaled or surpassed on seven days. 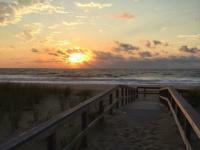 On the 1st, Vineland (Cumberland) and West Cape May (Cape May) reached 66°. Some 41 of the 64 NJWxNet stations were between 60°–65°, with Walpack (Sussex) and Wantage (Sussex) both only making it to 46°. The 2nd was even warmer, with eight stations up to 77°, 16 at 76°, and 36 between 70°–75°. High Point Monument was coolest at 67°. That was also the high at the Monument on the 3rd, while all other stations were in the 70°s. Cape May Court House (Cape May), Red Lion (Burlington), Toms River (Ocean), and Vineland all topped out at 78° that afternoon. The 5th saw Piney Hollow (Gloucester) and Vineland reach 71°, with Dennis Township, Oswego Lake (Burlington), and Woodbine at 70°. The last 70° readings of the month occurred on the 6th, with Cream Ridge (Burlington), Sicklerville (Camden), Toms River, and Oswego Lake at 71°, and 14 others at 70°. On the 19th, Oswego Lake made it to 65°, when 38 stations were between 60°–64°. Woodbine reached 67° on the 29th, when 66° was achieved at 11 stations and 48 others were between 60°–65°. High Point Monument only made it to 53°. The daily minimum temperature fell below freezing somewhere in NJ on 25 November days. These lows were not always in the morning, as sometimes they occurred late in the evening as colder air moved into NJ. Nine days saw Walpack, the northwest valley station known for its cold inversions, at or below 19°. The first of these was late on the 10th, as cold air poured into the state from the Arctic. Every station in NJ fell below freezing that evening, marking the first freeze of the season for coastal and urban locations. By midnight, High Point Monument was down to 15° and High Point (Sussex) and Walpack dropped to 16°, with West Cape May (Cape May) the “mildest” at 27°. The thermometer continued to slide down under rather windy conditions until bottoming out by daybreak on the 11th at 10° in Walpack, 13° at the Monument, 14° at Pequest (Warren), and between 15°–19° at 17 stations. West Cape May fell to 25°. The maximum temperature at High Point Monument on the 11th was 31°. This marked the first subfreezing day of the season in the state, and proved to be the only one for the entire month. The minimum temperature on the 11th at the National Weather Service's New Brunswick Cooperative Observer Program station was 20°. This tied the record low for the date, first set in 1956 (records extend back to 1896). It was also the coldest on record for so early in the season. Not only that, but it is the first freezing temperature of the season at this central Jersey location, occurring much later than the average first freeze date of October 20th. Perhaps most impressive was that until that morning, the first recorded sub-freezing temperature of the season at this location had never been colder than 25°, that mark occurring on October 27, 1936, October 31, 1966, and November 8, 2007. 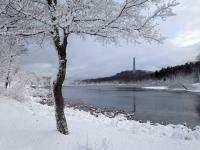 Last winter saw the first 20° minimum at New Brunswick on December 16, when the temperature dropped to 15°. The remaining days in the month with lows in the teens occurred at Walpack and three other sites, where radiative cooling on calm clear nights leads to rather frequent inversions. This includes the 12th with 17° at Walpack and Basking Ridge (Somerset), the 17th (19° at Walpack), 18th (17° at Walpack, 19° in Berkeley Township (Ocean)), 23rd (19° in Walpack), 24th (17° at Walpack and 19° in both Hopewell Township (Mercer) and Pequest), and the 28th and 30th (each with 18° in Walpack). The fall months of September through November 2017 averaged 57.8° across NJ. This is 2.6° above the 1981–2010 average and ranks as the 6th warmest fall since 1895. Six of the ten mildest have occurred in the past 13 years, each ranking between second and seventh (Table 1). It took the cooler-than-average November readings to bring the seasonal temperatures down to 6th place, after a September that ranked 10th warmest and October coming in as second mildest. The warmth in the early to mid-fall contributed to foliage changing color and dropping approximately two weeks later than average, much as occurred in 2007 and 2011. The first freezes of the fall were later than average by a few weeks in all but coastal and urban areas, where they were about on time. What a first freeze it was for a number of locations late on November 10th into the morning of the 11th, as recounted earlier in this report. Table 1. The ten warmest falls (Sep-Nov) across NJ since 1895. Like this fall’s mean temperature averaging close to that of 2016, the seasonal precipitation was also similar. This year’s statewide fall average precipitation was 8.93”, which is 2.62” below average and ranks as the 43rd driest of the past 123 years. Last year the seasonal average was 8.68”. This year, below-average rainfall in September and November more than compensated for the above-average October total, which for the most part accumulated during two late-month events. Ample winter precipitation is needed to fill the state’s reservoirs and boost ground water and stream flow before the summer 2018 water consumption season commences. The good news is that there is plenty of time for this to occur.